Jiving has become very popular in the last few years thanks to sensational young Country and Western singers like Nathan Carter and Derek Ryan, plus TV programmes like Stetsons and Stilettos following jivers around Ireland as they head to the weekend dance. 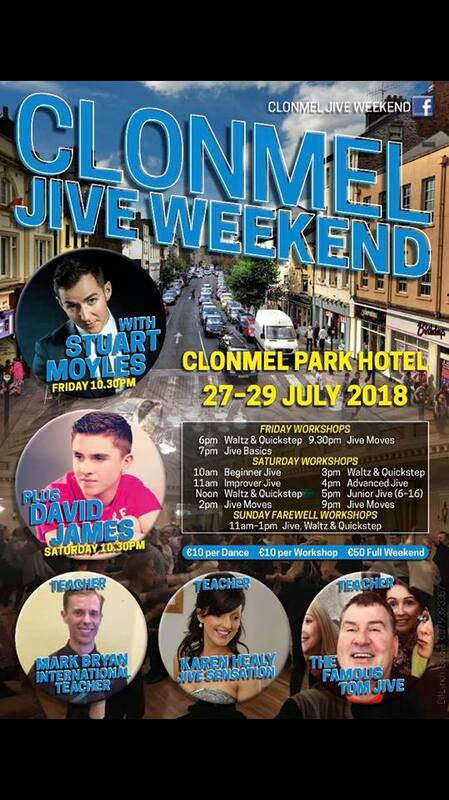 Clonmel Park Hotel is now hosting a Jive Weekend with workshops for beginners, improvers and some advanced classes. They will also have some Waltzing and Quickstep workshops. The workshops are by The famous Tom Jive, international dancer Mark Bryan and Jive sensational Karen Healy. This is the perfect opportunity to learn how to dance, or to improve your technique and style if you can already throw some shapes! Ladies and men’s steps are taught and no partner is required. Teenagers are welcome. Dancing on Friday night with Country Great Stuart Moyles and on Saturday with Young Entertainer of the Year, David James. Jive competition on Saturday night with a €500 prize for the winner. See Clonmel Jive Weekend on Facebook for details www.TomJive.com or call Tom on 087 3995877.